Fall is a fabulous time of year to get married, the heat of the summer is over, the leaves on the trees are beginning to show off their beautiful autumn colors and life seems to slow down a bit. That is except for the bride. You are a little stressed and in the midst of finalizing all of your last minute details. Checking on your wedding cake, favors, transportation, flowers, bridal gifts, music, your seating chart arrangements and etc. So now your attention is turned to your table centerpieces. OK, let me help you calm down by discussing a few details about using pumpkins for your table arrangements. You can choose to place fresh, dried or silk flowers in the center of your pumpkin. If you're using fresh flower, remember to put a little cold water in the bottom of the pumpkin just prior to adding the flowers. Doing this will keep them fresh. Placing a small potted plant inside the pumpkin is another great idea to create fabulous pumpkin centerpieces. If you are really creative and have the time, you can cut a design into the pumpkin and place a candle in the center. The light will shine through the cutouts and the top of the pumpkin if you leave the top off. Placing autumn colored leaves around the base of the pumpkin will dress up the look of your centerpiece while not adding too much to the cost of your table arrangement. 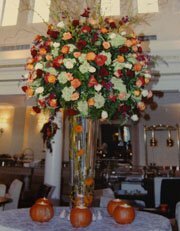 Setting the pumpkin on a mirror or fall colored piece of fabric will add another dimension to your arrangement. You can also surround the main pumpkin with smaller pumpkins or gourds. 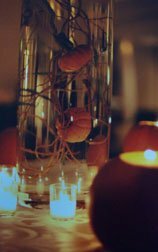 Arranging small votive candles around the pumpkin will add a touch of romance to your reception room. Using apple, cinnamon, vanilla or ginger scented candles will emit a wonderful aroma and your room will be very inviting. If using a fresh pumpkin doesn’t delight you, check out the craft stores and see if they have any wire or ceramic pumpkins that you can decorate to your liking. You can also purchase 14 inch pumpkin decorated plates and place gourds, Indian corn, acorns, colored leaves, candles or candy wrapped in autumn colors to be used as your wedding centerpiece. Be creative and let your imagination help you create your delightful pumpkin centerpieces. Check out my links below for more interesting ideas. Need creative ideas to make your wedding special?